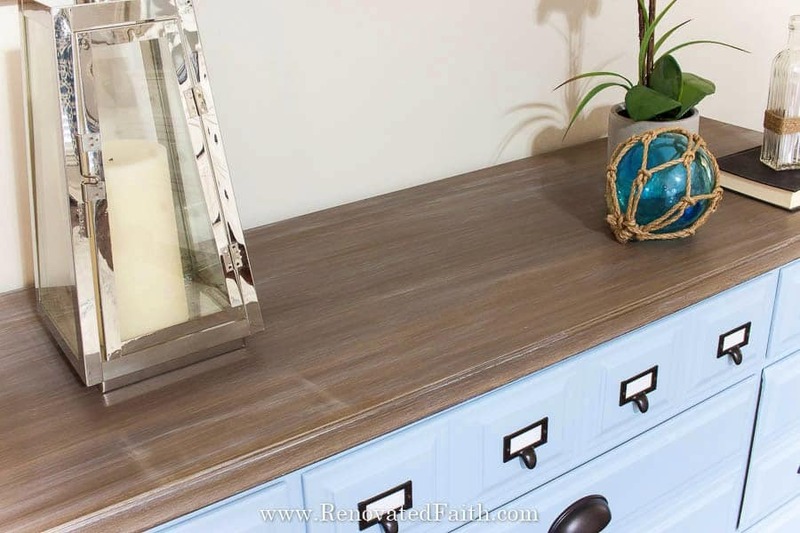 Ever wonder how to get the look of driftwood on your existing furniture? Many tutorials will show you how to get this weathered wood look on raw wood as a driftwood finish stain, but this process gives you the same look on ANY surface. 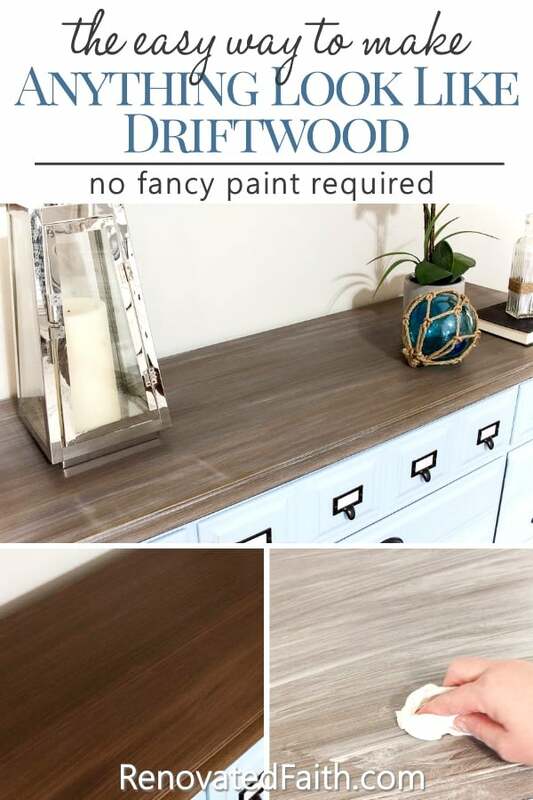 Whether you want to refinish a stained dining table or a painted dresser, I’ll show you how to get a DIY driftwood finish on any surface in few easy steps. Reese Witherspoon once said, “My rule is: if it’s not moving, monogram it.” As a Southern girl myself, I definitely love her classy taste and desire to monogram ‘all the things’. It’s true that some furniture in my house have been painted not once but twice or EVEN three different times. I’m not much of a pack-rat but I’m very sentimental about furniture for some reason. The cabinet that held our 20 gallon aquarium when I was a kid is not repainted and in our office. The headboard my dad used was transformed into a set of shelves, now in my daughter’s room in a shade of soft pink. And the desk I am sitting at is made of an old door and two short shelves that were once my grandmother’s. 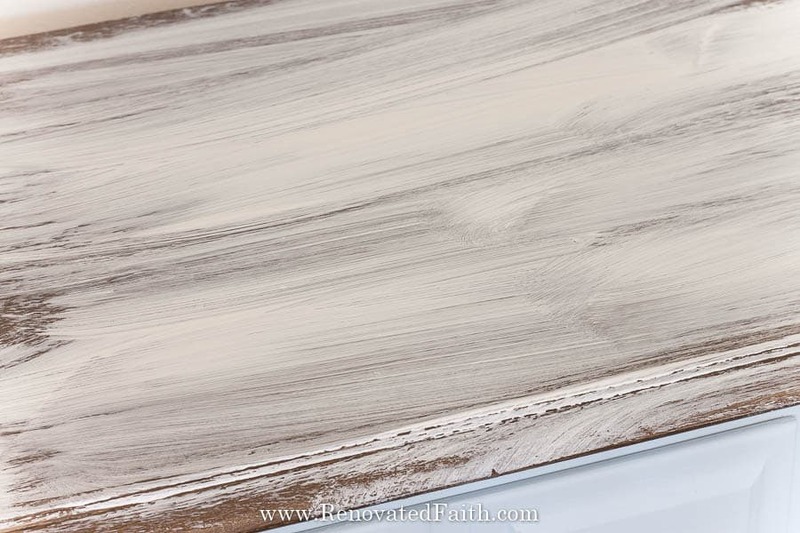 So what is driftwood finish? I’m sure you have noticed the driftwood or weathered wood finish on the pages of your latest Restoration Hardware or Pottery Barn catalog. Often times their stained furniture looks like distressed beach wood and goes well with farmhouse and coastal home decor. See my DIY farmhouse home decor here. After some trial and error, I’ve figured out how to paint a driftwood finish on any surface, not just raw wood. 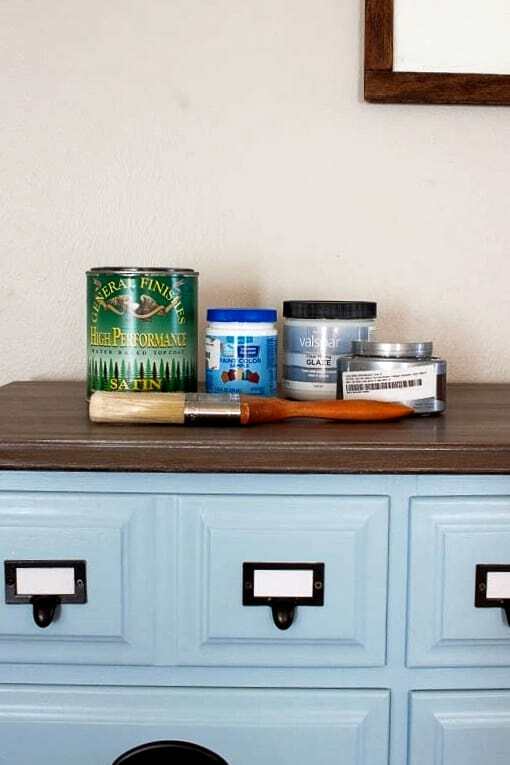 In other words, whether it’s a dark stained coffee table, a laminate desk or a painted dresser, you can get a Restoration Hardware stain – DIY version! Also, If you read my post Why I Don’t Use Chalk Paint, I’m a big fan of using good, old latex on furniture. You could probably get a driftwood finish with chalk paint but latex has been around for decades and I’m convinced you can get a more durable faux driftwood finish with less hassle and pay much less. This post may contain some affiliate links at no extra cost to you. See my full disclosure here. Valspar Clear Mixing Glaze at Lowe’s – I’ve tried others. Get this! Brushes – this set is great! Top Coat – I LOVE this stuff! *Cost-saving tip: If you are doing a small piece of furniture or just the top of a piece, you can get the sample sizes of these colors. 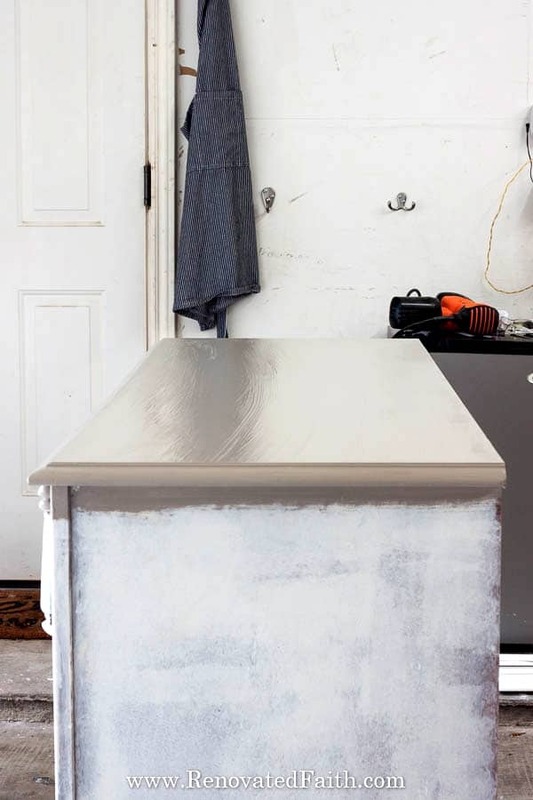 I‘m a big proponent of sanding and priming furniture before painting because you want to make sure that your base coat sticks to the surface now and for years to come. 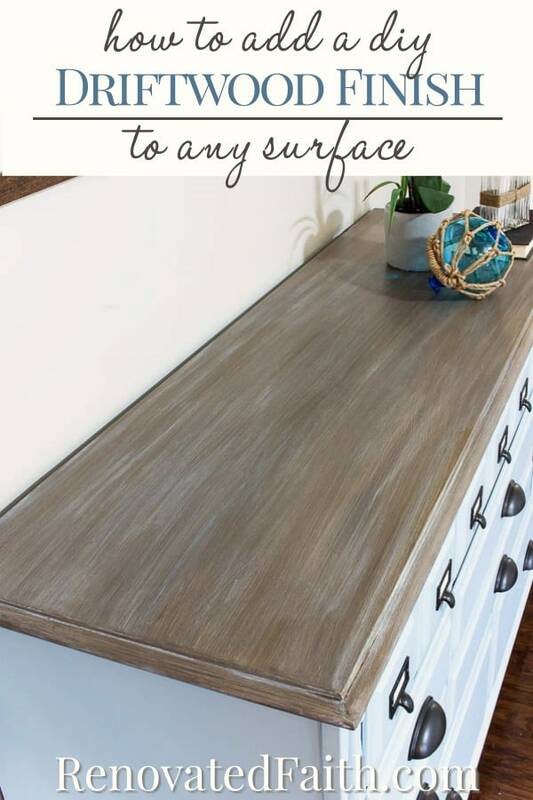 In my post How to Sand Furniture in Less Than 5 Minutes, I share about how to prep your furniture surface easily. After sanding, paint over the surface with a primer like Zinsser’s Bullseye 123. To save a step, you could even have your primer tinted the same color as the base coat and skip the base coat altogether. For raw wood: If you are wondering how to get a driftwood stain on pine or how to make wood into driftwood, you’d follow the exact same process as described. However, I wouldn’t worry about primer with raw wood; just sand over it for a smooth surface. Perfect for a driftwood weathered wood finish, Lowe’s carries a Sherwin Williams color called Coastal Villa that we will use as our base coat. 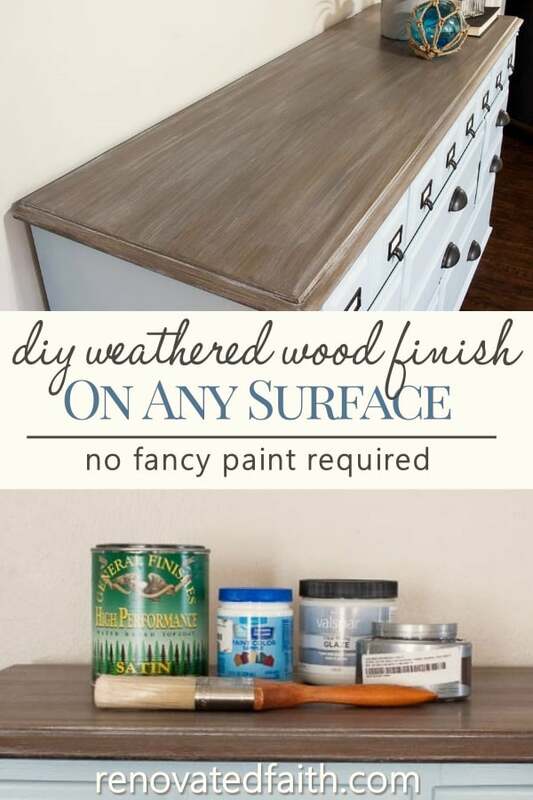 Paint it over your furniture surface with a brush, not a roller. This is the one time we actually don’t mind seeing brush strokes because they will mimic the texture of wood grain. Be sure to brush in long strokes from one side to the other. After your base coast has dried (check the re-coat time on the can), you can add your wood grain by mixing a 1:1 ratio of the harvest brown with the clear mixing glaze. Stir it well and then paint it on your piece. The mixing glaze helps it to stay wet longer but I wouldn’t waste a lot of time during this part. Paint this mixture on your piece in long strokes, not picking up your brush until AFTER you have reached the edge. This mixture will naturally have long streak marks from your brush and that gives it the look of wood grain. Just keep making brush strokes from left to right until you get the look you want. If it’s getting too dark. Wipe off your brush with a paper towel between strokes. Getting to light? Add a little more of your paint/glaze mixture. You can really determine how dark or light you want your finish with this process. Just keep brushing in long strokes and you will start to see the glaze mimic the look of wood grains like in the picture below. When you get the look you want (and it will look AMAZING! ), decide you are done with this part and don’t touch it again until it’s dry. 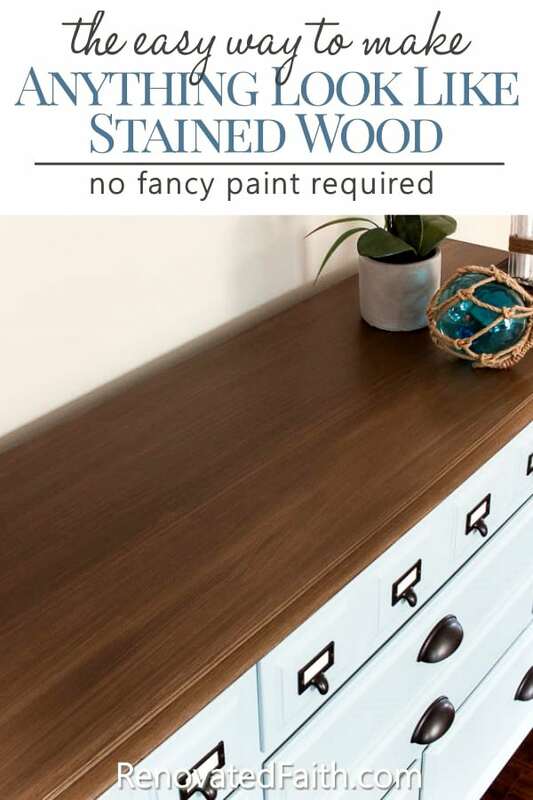 If you like the look of stained wood, you can skip the next step and just add the same topcoat as I listed below. The process for the stained wood look is the same as the driftwood, just without the white wash and you can see it in detail here: How to Stain That Looks Like Paint. Now that we have the look of wood grain, we want to add that smokey finish to get the beachy, weathered look. Mix a 1:1 ratio of white paint to your clear mixing glaze and paint it all over the piece. Now get a baby wipe and ring it out a little bit. I like to wipe in long strokes back and forth and wipe most of this mixture off. 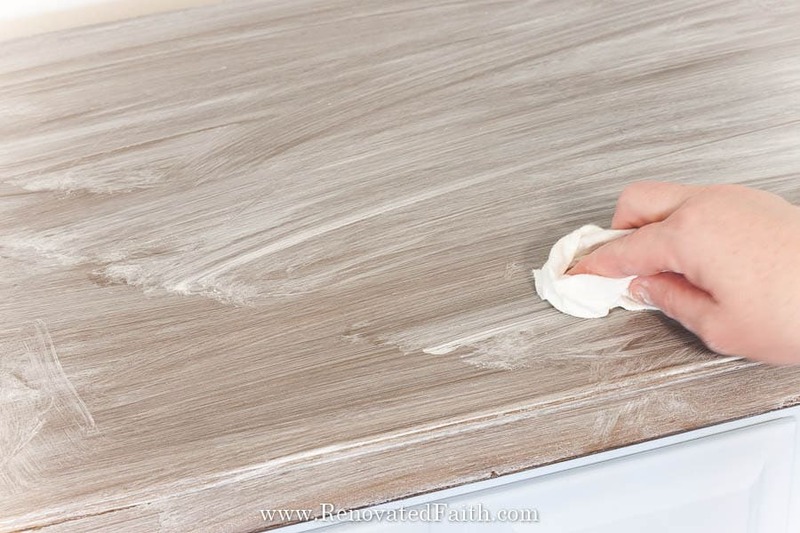 As you wipe off, you will see how the streaks give a really nice effect to the finish. You cannot mess this part up. Just keep wiping or adding a little more paint mixture until you get the depth of color you want. Let it dry. 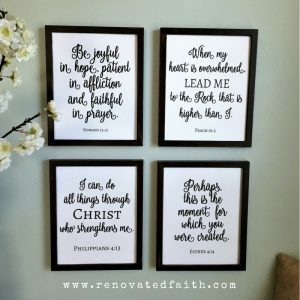 This part of the process is similar to my post How to Whitewash a Brick Fireplace, where I gave our outdated brick fireplace a faux German Smear look. It’s not completely necessary but I like to add a top coat for added durability. I like General Finishes satin top coat and it also comes in a matte(flat) finish too. This topcoat is nice because it is water-based meaning it’s easier to clean up brushes and also has little odor. It also will not yellow like some top coats will over time. Just paint the top coat on and check for drips after a few minutes. 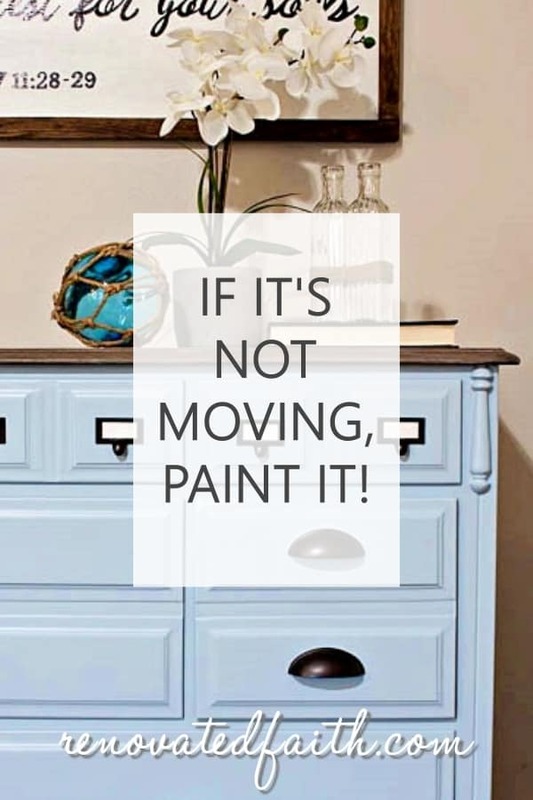 To save time on your furniture project, be sure to check out my best painting tips. I promise you will be happy you did. What’s nice about this process is that it’s so versatile as it can be used on any surface including painted furniture, stained furniture, etc. I have a friend who wanted to know how to make sticks look like driftwood for a “bouquet” on her mantel. She tried this process for sticks in her backyard and it worked! Please let me know how your driftwood finish turns out!!! 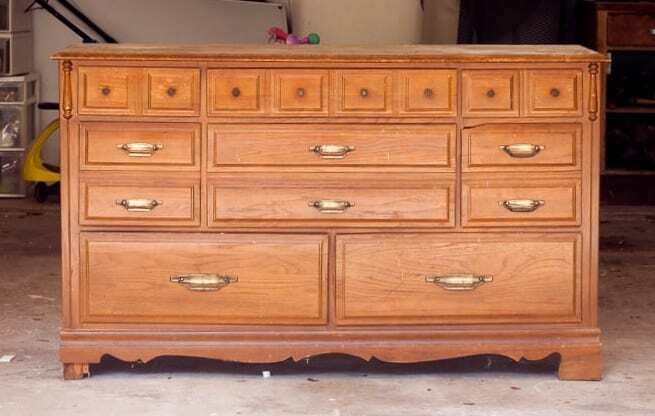 Be sure to check out this post for the big reveal of this dresser. It went from a horrific, stinky mess to one of my absolute favorite furniture pieces so far! Here is the before picture. Click here to see how it turned out! Hi there, what a gorgeous piece! When you listed SW Coastal Villa, did you mean to say that is Valspar’s Coastal Villa? (SW doesn’t list this color anywhere) – the Coastal Villa would be the underlay hue of the gray in driftwood, right? Also, when you describe the glaze, you left out the ratio color – is it 1 part Harvest Brown with 2 parts Clear Glaze? Lastly, do you feel an off-white would do as well as a bright white? (for the whitewash effect). I’m guessing a brighter white would give a piece a more fresh, crisp look? Such great questions! And yes, you are exactly right. I is actually Valspar’s color Coastal Villa that I got in a Sherwin Williams paint sample. Also, the ratio of glaze to harvest brown is 1:1. Thank you so much and yes, I think off-white would have a nice look also. Thanks for stopping by and I’d love to see pictures when you are done. Hi Karin, I love your driftwood technique but I need a lighter drifwood. Gray tones with some beige/sand and just a hint of dark browns. Any suggestions you might be able to give me would be appreciated. You can do this one of two ways Jeanne. You can add an extra layer of whitewash which is really easy to do. OR you can do a lighter, grayer base coat. Either way will work well! Best of luck and thanks for your comment.